On a recent morning, I opened a Portugal guidebook we are using to plan our trip to Lisbon to a random page with a picture of a quintessential castle. It reminded me of one of our favorite adventures in Umbria during our Honeymoon–exploring the Rocca Maggiore in Assisi. The castle described on the page was in Sintra, Portugal. To my surprise, upon further reading, I discovered that Sintra is a short 35 minute train ride from Lisbon, where we will be staying. 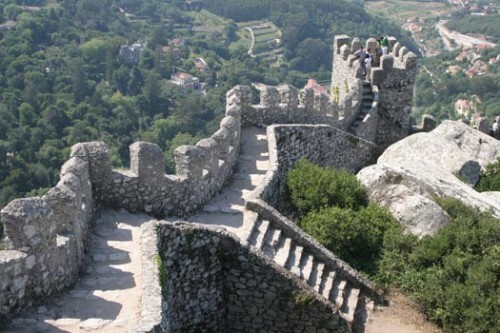 Sintra’s Moorish Castle’s appearance conforms to many storybook stereotypes of medieval castles. Not only is Sintra home to the Moorish Castle, but also the National Palace (a historic royal residence that is still used for receptions today) and the Pena Palace (a “fantasy” castle built in the style of King Ludwig’s famous Neuschwanstein castle in Germany. Other sightseeing options include caves at Quinta de Regaleria and exotic gardens at Monserrate. With the LisboaCard that we are planning on buying, admission to the National Palace is free, and discounts are available on admission to the Pena Palace, Moorish Castle, and Monserrate gardens. The train trip (usually only 4 Euros round-trip) is also included with the LisboaCard. After reviewing the exciting sightseeing options in Sintra, we are strongly considering adding it to our itinerary. Side trips from major cities are a great way to get acquainted with the culture and landscape of the countryside. The sights in Sintra warrant about half a day for us. We are actually thinking we may journey to Sintra on the afternoon of our arrival in Europe, because many sights in Lisbon are closed on Monday. We were previously very satisfied with a similar length side trip we did to Chianti while staying in Florence (that one was done by bus). We strongly recommend travelers look at opportunities to get out of the main cities. Many travel books will often have special sections dedicates just for side trips. Public transit is extremely well organized in Europe and most side trips are very doable without a rental car. This entry was posted in Travel and tagged Europe, Lisbon, Portugal, Portugal/Spain 2012 Trip, travel planning by Ryan. Bookmark the permalink.